The Honeymooners and Top Cat from The Phil Silvers Show; and The Jetsons was very much like Blondie in a radically different setting. 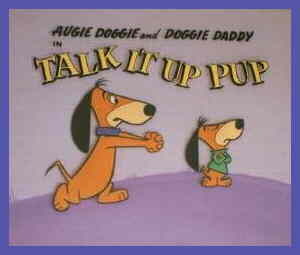 Augie Doggie & Doggie Daddy was an early example in which they ripped off themselves — possibly the first, depending on whether the presence of two mice instead of one in their Pixie & Dixie series was enough of a variation from Tom & Jerry to disqualify it as a direct copy. The situation in Augie & Daddy closely resembled that of Spike & Tyke, a minor series Bill Hanna and Joe Barbera had done years earlier, as directors at MGM. Augie and Daddy debuted on September 29, 1959, as one of the back segments of Hanna-Barbera's second half-hour show, Quick Draw McGraw. (The third segment was Snooper & Blabber, a pair of detectives.) Augie's opening episode, as well as those of the other two segments, was written by Michael Maltese, whose gags had livened the Road Runner & Coyote series, as well as many other Warner Bros. cartoons. Daws Butler (Huckleberry Hound, Chilly Willy) provided Augie's voice, and Doug Young (doing an imitation of comedian/character actor Jimmy Durante) did Doggie Daddy's. The basic situation, like that of Spike & Tyke, was a not-overwhelmingly-competent single canine father, raising a precocious youngster. In the earlier series, they were bulldogs living in a doghouse in someone's back yard; but Augie and his dad were breedless mutts, living as typical 1950s-60s funny animal suburbanites. Augie was cheerful and polite, and adoringly devoted to "Dear Old Dad" (as he usually addressed his co-star), despite the fact that Augie would clearly have been more competent in the leadership role. Quick Draw McGraw remained in production for three seasons, a total of 45 half-hour shows. Augie and Daddy remained in their slot through its entire run. The 20th episode, titled "Gone to the Ducks", introduced a character who was to become a minor Hanna-Barbera star in his own right — Yakky Doodle, who later had a back-up segment on Yogi Bear's show. An early version of Snagglepuss, who starred in Yogi's third segment, also guest-starred with Augie and Daddy a couple of times. They weren't tremendous successes outside of cartoons, but did star in a Gold Key comic book in 1963, albeit for only one issue. They also appeared in the back pages of several other comics from Gold Key and Dell. After Quick Draw's run ended, Augie and Daddy remained minor Hanna-Barbera supporting characters, appearing in Scooby-Doo's All-Star Laff-a-Lympics, Casper's First Christmas and other ensemble productions. It's been several years since they turned up in any new ones — but the old ones, as well as their original run on Quick Draw McGraw, are still seen from time to time as reruns. Text ©2002-10 Donald D. Markstein. Art © Hanna-Barbera.